“Must-stop-baking-cakes,” I muttered to myself as I browsed the blog of this month’s partner for Taste & Create, Happy Cook of My Kitchen Treasures. I seem to have baked a lot of cakes recently, many of them from my T&C partners or other bloggers, and the effects on my waistline are noticeable. It wasn’t easy though; there were quite a few sweet dishes I fancied trying, such as Apricot-Marzipan Bundles, or coffee-craisin-mascarpone loaf. Or moelleux au chocolat. Or raspberry financiers. Well, you get the picture. HC likes making panna cotta too, and I love panna cotta. But still, I tore myself away and decided that since HC obviously knows what she’s talking about when it comes to Indian food, I would make Kadai Murgh. Excellent choice — we both really liked it, and scraped our plates clean. I served it with a Basmati rice pilau and some yoghurt — sadly no Geeta’s mango chutney, because our local Carrefour doesn’t stock it any more — most upsetting. This dish is dead easy to make; you can do it in little more time than it takes to cook the rice. Mine doesn’t look quite like HC’s, because I couldn’t get any tandoori powder, so I had to make do with a spoonful of paprika and some ras-el-hanout. When I tasted it at the end of the cooking time, it was a bit too spicy for me, so I just added an extra spoonful of crème fraîche to tone it down. Definitely a keeper, so thanks HC! Visit My Kitchen Treasures for the real recipe. Here I give my own way of making pilau rice; I’ve been doing it this way for years and it always produces rice that is not soggy or stuck together. Of course you can vary seasonings to suit yourself. For two not very greedy people, take a glass or cup of about 220 ml capacity and fill it about 3/4 full with Basmati rice. Finely chop a small onion or a shallot or two, and crush a clove of garlic. Heat some vegetable oil in a pan with a tight-fitting lid. Soften the onion and garlic in it for a few minutes, then add the rice and stir to coat it with oil. Fill the glass to the top with cold water, pour into the pan, and stir once just to loosen anything that might have stuck. If you like your rice a bit more cooked than I do, you can add a little more water — a tablespoon or two. Season to taste: I use salt, pepper, two or three crushed cardamom pods, and a bay leaf. Sometimes I add crushed coriander seeds or cumin too. Put on the lid, turn down the heat to very low, and leave to cook completely undisturbed for 15 minutes. Do not take off the lid or stir! At the end of this time you can take a peek; all the water should have been absorbed, and you can test the rice by eating a bit. If it’s done, turn off the heat and stir it up a bit in case it’s stuck to the bottom of the pan. It will keep warm with the lid on for another 10 minutes or so. Wow you are so fast in making them. I still have not decided what to make. I know the chicken will be a wee bit spicier if you are not used to really hot stuff, but then clever of adding more cream. Good to hear that you enjoyed the dish and your dish really looks super yumm. 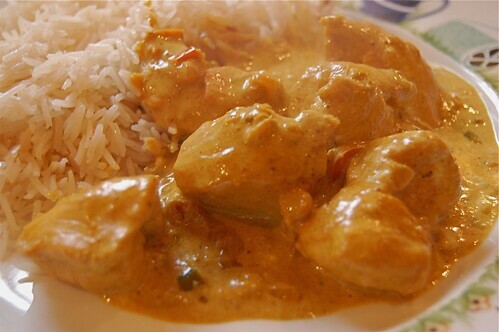 Mmmmmmm……….chicken curry. Sorry if I sound like Homer Simpson but this picture is so enticing, I must make this asap! I noted your answer to my pizza quest on Slow Travellers, and have now put a note to check your recipes..